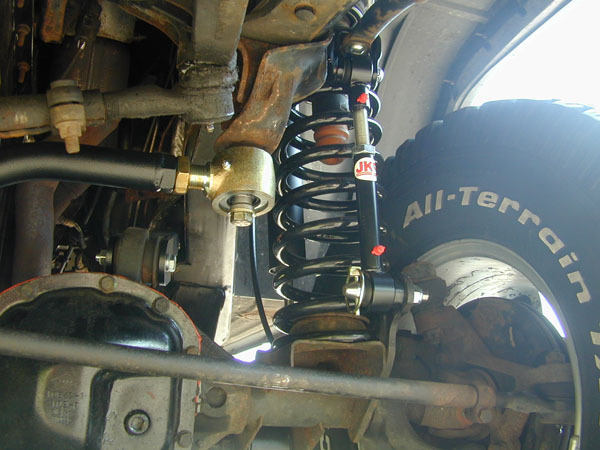 Our adjustable track bar gives you the strength and adjustability your lifted Jeep needs. A greaseable Johnny Joint is used at the frame end, and a maintenance free dual durometer Giiro Joint bushing is pressed into a machined housing on the axle end. What is different about this track bar is the lower bushing. Many customers have complained that their stock, or previous track bar has loosened up and damaged and egged out the factory hole. This track bar uses a much larger 9/16s Grade 8 bolt to allow you to drill out your factory location and easily upgrade to this HD bushing. Put it simply, this is the strongest, most adjustable track bar on the market. Track bar comes powdercoated black. Comes with a 9/16 hardware and a new lower flange tab to fit into the OE location at the axle side. And a LIFETIME WARRANTY! Center to Center Min = 31-1/8", Max = 32-3/16"
Recommended heights : TJ/LJ 4-5"
Recommended heights : XJ/ZJ 3-6"
NOTE : We recommend using a drop pitman arm when using a drop track bar bracket.